This is the members area that I mentioned in the video, you can trial it for 5 days for free: Adam Eason Hypnotherapy Members Area. I find this incredibly frustrating and have encountered much more of it recently and decided to vent a bit about it in this video. Watch the clip and see why I think it is a problem and why I believe the “as long as it works mindset” is a “crocodile dung” mindset…. Happy New Year to you and yours! I found myself engaged in a profound demonstration of confirmation bias listening to you in this clip. Thank you for flying the flag for evidence based practice and for being one who contributes to that evidence base. Once more you have given me pause for thought. A colleague and I are in the early stages of developing a research project, hopefully to be conducted this year. One of the things that troubles me when I think about our research is that whilst we hope to be able to demonstrate that a particular intervention works I don’t think we will be able to say WHY it works. I wonder then if we are just perpetuating the use of crocodile dung? We will not have access to resources or funding to conduct MRIs for our study subjects and I dare say we might have issues in gaining ethical approval to conduct the research if MRIs were a component. I am interested in your view on this dilemma. With thanks and warmest best wishes, Kym Peoples. 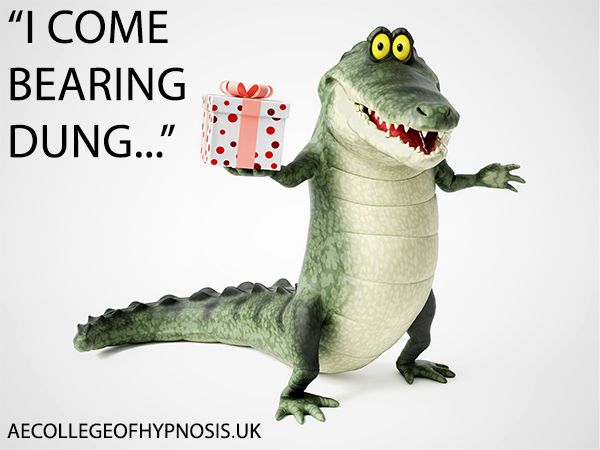 You have stumbled across something that has often been cited in hypnosis research. How do we know for sure what was creating the effect? So that is typically why we need the research to be peer reviewed, or for a really thorough literature review to be conducted prior to the experiment, os that your experiment is informed and your hypnothesis makes sense before you begin. Likewise, you’ll then be familiar with the ways in which similar topics and experiments have been covered and undertaken which will give you a good idea about your own methodology and ensure it is considered thoroughly and duly scrutinised before the experiment commences. The challenge is that simply showing something has an effect does not in and of itself prove what was responsible for the effect. We do not always necessarily need to know why something works, especially if you are demonstrating efficacy for the first time and plugging a gap in the existing literature, but the real contribution is discovering what specific mechanism or variable was responsible for the effect/difference between controls and the experimental group. It’s tough to give you a really thorough response on a blog comment space, but if y ou want to chat about it sometime, get in touch with me. (And let’s have lunch when I come to Australia – we need to get Michael to pull his finger out and get planning! ).